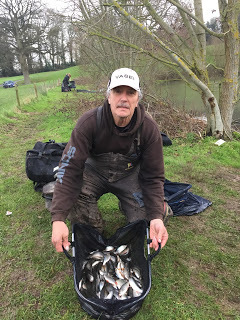 With Steve and Cindy from the Oak away this weekend we decided to meet at Coxes to do the draw, I had to meet Ash first as he didn’t know where that was (which shows how often he fishes the river!). Most of the others were already there and looking at the river I thought it looked perfect with a nice tinge of colour but the decision was made to switch to the pond and to be honest I don’t mind where we go as both venues are fishing really well. 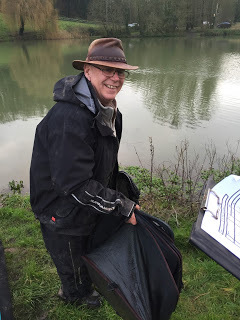 After a short drive we reached the pond and there were two pleasure anglers on pegs 17 and 18 which prompted Heardy to ask what I was going to do now as I’d have to fish a different peg! – cheeky git! Rob announced the draw and I was hoping for a peg on the near side but ended up on peg 4 which can be a decent peg. Harry said he can’t seem to get away from the far side and in recent matches he’d been on pegs 4 and 6 so it was no surprise when he pulled out peg 7 and at this rate he might get round to the near side by about 2017! 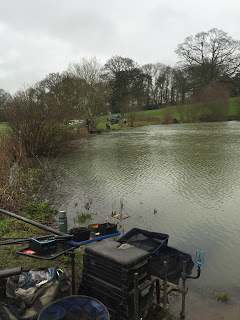 The pond was coloured and with it being mild I thought it would fish better than the last time and 15lb would probably be needed to win with the possibility of some skimmers showing as well. I mixed up some Bait-Tech Pro Nat Dark with some SSP Dark Silt groundbait added and left it to settle while I set up the rest of my kit. No surprises there as I set up the same two rigs that have served me so well of late, a 0.5 gram Drennan Roach for on the deck and a Preston Chianti for up in the water. Both rigs had size 18 barbless Kamasan B611’s and 0.10mm hooklengths, for the deep rig I had Drennan Aqua elastic in the top kit while the other had Daiwa Yellow Hydro. On the whistle I cupped in two balls of groundbait ay 10 metres before starting over it with the hook buried in a caster, I really thought I’d catch straight away but this didn’t happen and I started to think my earlier optimism might have been misplaced. But then Bruce swung in a small fish on the whip and shouted up that it was a small chublet! I thought he was either winding me up or as we’d suspected for a long time, he’d lost his marbles! He was getting a fish a chuck with the majority being little chub (yeah right Bruce!) whereas I had now switched to single maggot and still couldn’t get a bite! From what I could see, nobody else was really catching at this early stage, then after about 15 minutes I finally had a bite which of course I missed, next chuck I had a small roach and started to get regular bites but was missing or bumping quite a few so I put on another hooklength and promptly bumped the next one too! I did try caster but they weren’t having it yet so it was back to maggot for the time being. I had a couple of smallish roach then hooked a slightly better fish which turned out to be a 3oz chublet so Bruce hadn’t been seeing things! 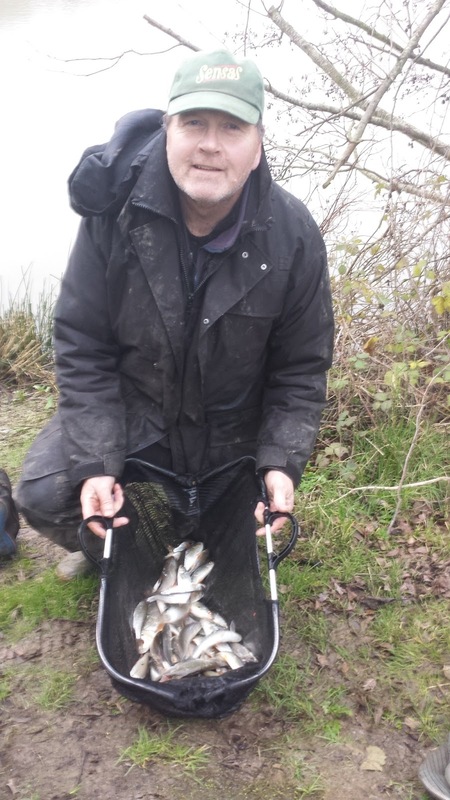 It turns out the club have stocked some small chublets, which is great news and hopefully they will do as well as the original stocking of chub, with most of those old warriors over 3lb and some approaching 5lb, lovely fish. After an hour I had around 15 fish, including a couple of chublets but no real quality fish yet which was a bit of a worry as Bruce had around 75 fish already which included a load of those chublets. From the sounds of it, Martin, Rob and Steve P on the bottom bank were all really struggling for bites and only getting the odd fish. The second hour was better and I added another 22 fish but despite getting bites on caster, I couldn’t catch those better roach which I needed if I was to stand any chance of catching Bruce up. I was still missing quite a few bites and there were obviously fish up in the water so going into the third hour I swapped to the shallow rig and carried on catching but still no quality. 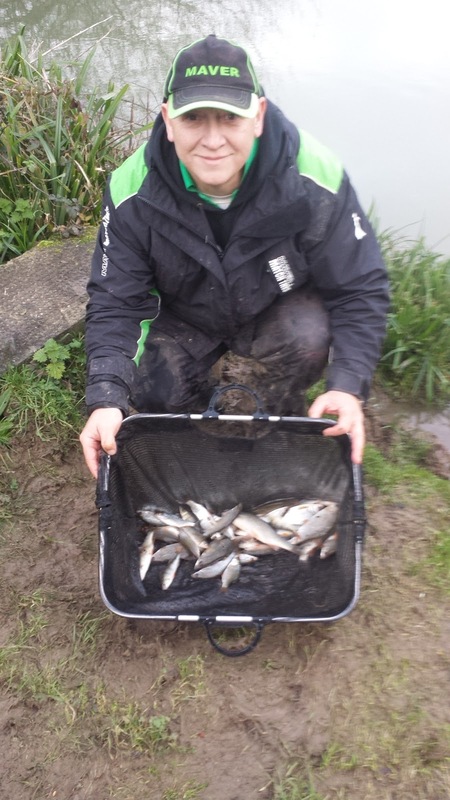 I could see Ash over in peg 20 was catching well and netting the odd fish and it was looking like it would be between him and Bruce although I didn’t know how Fieldy was doing in peg 24 as there’s always a chance of chub there. After three hours I was up to 57 fish but hadn’t used my landing net yet, I went back out with the deeper rig and decided to up the feed to try and get the fish to feed on the deck so instead of feeding ‘little and often’ I fed a pouch of hemp and one of caster just once every chuck. 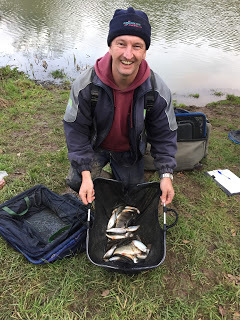 It worked to a certain extent as I had 21 fish in the fourth hour including a decent rudd and a perch of 8oz or so but with an hour and a half to go I was having to wait longer and longer for bites. 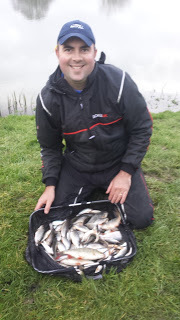 I kept putting odd fish in the net and as the light started to fade, I started to get some slightly better roach but even though my final total of 102 fish (which included half a dozen chublets) was more than I had in the last match here I knew I had nowhere near the weight I had then. Ash shouted across to ask how many fish I’d had, I told him and he said he’d had 115 so I knew he’d beaten me as he had some quality fish. Bruce had finished up with 201 fish and would be there or thereabouts as well, he also had the scales so as soon as we’d packed up we headed to Justin in peg 2 to start the weigh in. 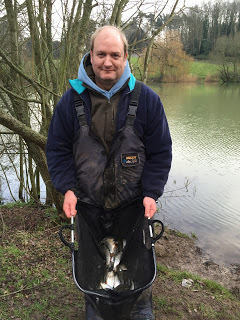 I thought he’d struggled as he’d walked a couple of times during the day so I was surprised when he weighed 8lb 14oz and he had some nice fish, I thought it would be close between us and it was. Bruce called my weight at 8lb 8oz and I’d fallen just short of Justin’s weight. Then Bruce went into the lead with a level 12lb, Harry didn’t weigh in from peg 7 and then Baz had 6lb 8oz. 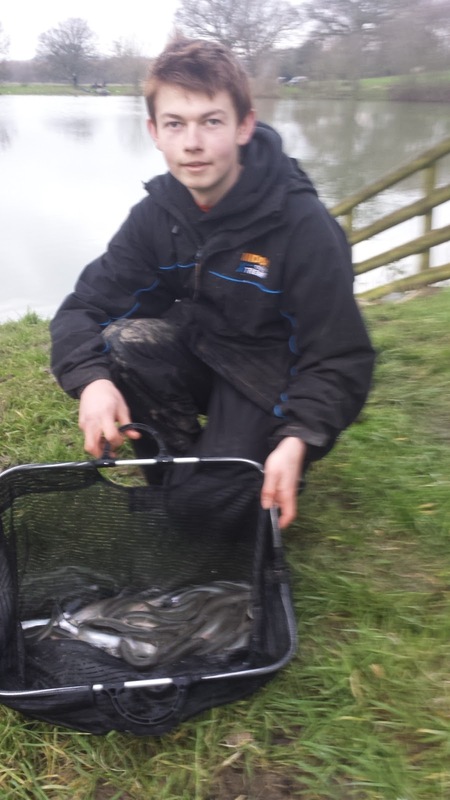 Jake was last to weigh in our section and had 5lb which included a couple of nice skimmers. 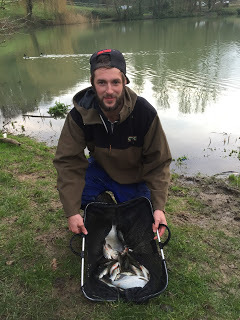 We drove round to meet the others and as expected, Ash had done well, just pipping Bruce by 2oz for another victory, Heardy finished second in that section with 6lb 5oz, Fieldy had 4lb 10oz from peg 24, Karl had 4lb 5oz of chublets on the waggler, Rob weighed 3lb 8oz and Steve P didn’t weigh in. So as Justin framed I picked up the £20 section money by double default and had a nugget off Steve. *Thanks to Rob Cox for the photos. In the league, Fieldy still leads with nine points, followed by Heardy and me on twelve and Bruce on thirteen so with only one match to go, Graham has one hand on the title and just needs to finish third or better in his section to clinch it but second and third are still up for grabs.